We believe that our program provides rigorous background in the various fields of study, held together by a concern for the underlying structures of thought and expression -- the dynamic relation of trivium and quadrivium envisioned by the architects of the original artes liberales. Our regularly compete and place in national competitions, and go on to enter a range of selective and demanding schools: Harvard, Stanford, Swarthmore, the University of Dallas, New York University, and West Point, as well as state universities and local colleges. In 2012, 199 students nationally took the Homeric form of the National Greek exam. Of those, only six earned Highest Honors; of those, two were the two from Dr. McMenomy's Greek IV class who took the exam that year. Of those, Lucie Buisson, also won the National Greek Exam scholarship that year (renewable for four years). Students from the class of 2012 went on to win Classics Department awards at the University of Dallas and induction into Phi Beta Kappa. In 2016, students won Gold and Silver awards; this was Olivia Liu's fourth gold medal in four years. Over the last twenty years, three of DrMcM's students have competed in Amherst College's Harry de Forest Smith Greek scholarship competition. All three of them have been offered the prize (though not all have chosen to attend Amherst). 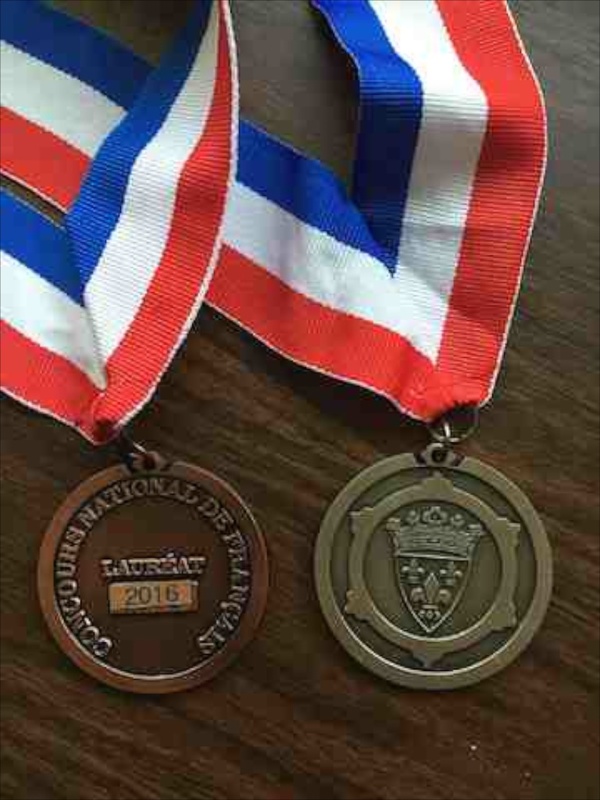 In 2016, four SO French students won silver, bronz, and honorable mention awards in the National French Contest. We offer a number of college preparatory courses, including several officially recognized by the AP review committee, that are designed to prepare students to take the College Board Advanced Placement examinations offered in May each year. Many of our students score well enough on the examination to receive advanced placement and even college credit for work done at in these courses. Recognition and placement or credit awards based on AP examination performance vary from college to college, and sometimes even from department to department within a college or university, so be sure to check with the colleges of your choice to determine their AP recognition policies. We work with those students applying to college, informally supplying some information on the selection of colleges and providing letters of recommendation for students who have completed sufficient work with us to allow us to evaluate their abilities. More formal support includes a Moodle forum for parents and students on choosing colleges, writing application essays, creating portfolios and transcripts, taking National Merit, SAT, AP, and CLEP examinations to gain recognition for academic work, and filling out FAFSA and CEEB financial aid forms. Class of 2019: be sure to let us know where you are accepted!